Siberian Jelly - Mrs Charge Barton Hale Six pints of apples to 3 pints of cold water to boil untill the juice is extracted, then to be put through a seive, but not squezed, add to every quart of juice one pound & quarter of grated sugar, to boil untill it becomes a strong jelly, when near cold put it into small pots, & turn it out when wanted for use To preserve Cucumbers Take fresh gathered gerkins of a large size, and lay them in salt & water for two days; then drain & wipe them dry put them into glasses, make boiling hot a mixture of sugar, vinegar, & water a small quantity of each; pour it over the cucumbers cover and set them in a warm place, wherein boil the liquor & pour over them for 3 successive days. Then take a quart of the liquor, add to it plenty of cloves, mace, ginger, & lemon peel. 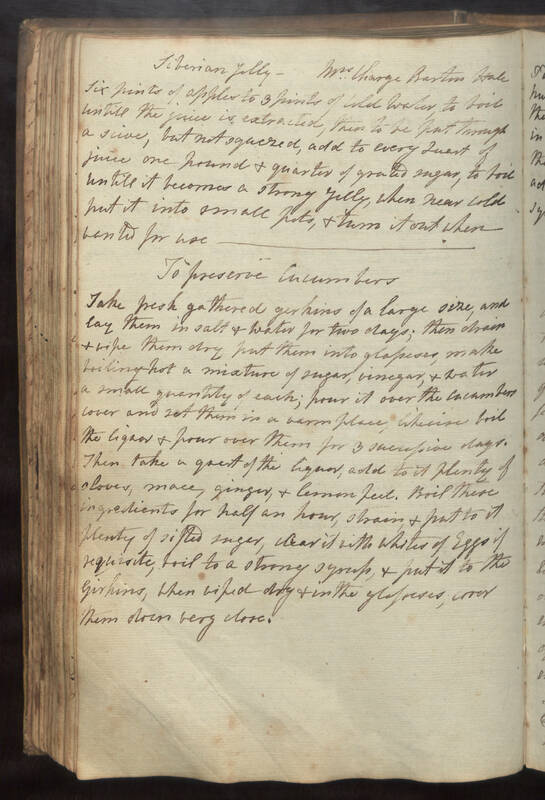 Boil these ingredients for half an hour, strain, & put to it plenty of sifted sugar, clear it with whites of Eggs if requisite, boil to a strong syrup, & put it to the gerkins, when wiped dry & in the glasses, cover them down very close.